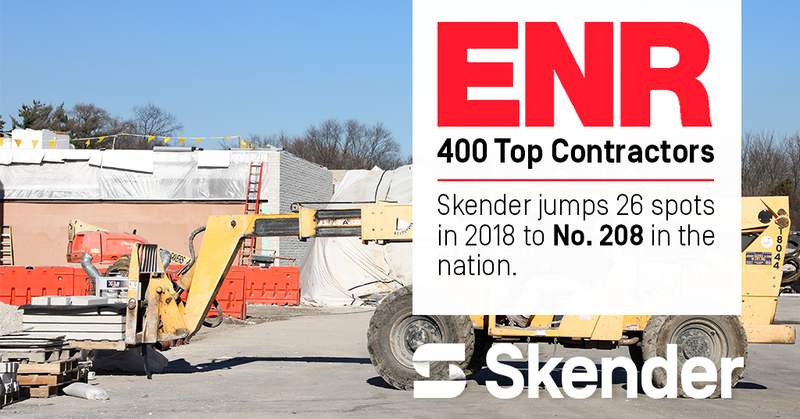 Skender ranked among the top U.S. contractors, according to Engineering News-Record (ENR) magazine’s recently published list of the largest contractors by revenue. Ranked at No. 208 out of 400 U.S.-based contractors, Skender moved up 26 spots from last year’s spot with 2017 revenues of $400 million. Some of Skender’s prominent projects in 2017 included the 168,000-SF HQ relocation for GGP, a 100,000-SF multifamily rehabilitation, a 62,000-SF affordable senior housing facility in Chicago, as well as several projects for major Chicago healthcare systems. Skender’s San Francisco office also expanded in 2017 with many new projects and project team hires.